Herschede Grandfather Clock what is the value? I purchased a mode #217, Herschede Grandfather Clock from Leitzel Jewelry in Millersburg, Pennsylvania on August 6, 1969 and it traveled to Texas with me in 1983.
has real tubular chimes and plays: Westminster, Canterbury, and Whittingdon melodies. The clock is in excellent condition and I am looking to find the approximate worth of it today. I am contemplating on selling it in the near future. The demand for grandfather clock is more these days. My father purchased one if it a couple of months back and have painted and polished it. I think this is really an antique piece and very rare too. I have a Herschede Havorford in great condition that I want to sell. Contact me at whatevergs@comcast.net for pictures if you are interested. is the clock still for sale ? Reduced price for sale in Jan. In excellent condition...would like to sell by early Jan. Currently in storage. $4,200. Did you receive the clock photos sent earlier today? Is your clock still for sale, and do you have a picture of it. Please contact me at marilynray@comcast.net. Thanks! Great condition 9 tube Herschede, one owner. Priced to sell now, $4,700. Excellent condition Herschede Hall clock, from mid-70's for sale. Prefer to have it stay in the NE area, instead of shipping. Located in MA. Is in great shape...estimated value is $14,000. Am selling for $8,500. 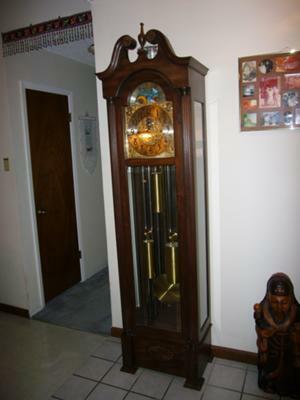 I am willing to take a reasonable offer on my Herschede Grandfather clock. 9 tube. Excellent working condition. Has been sitting for a while, but all works. I live in NJ and inherited a 1030 clock from my great great Aunt who lived in Philadelphia and bought the clock around 1929. It is mahogany and works perfectly. please call 772-231-3764 if interested. I'm guessing the cost is about $9000 but I need to do more research to be sure. I have a Herschede Grandfather clock also. Where do I find the number on the clock. I am looking to sell it. I had it serviced a couple of years ago, but it was too loud for the family and they didn't want to hear the noise. So it just sits, but does work. I would like to find out what the value is and possible sell it. It stands approx 7ft tall, it is all wood case with glass windows on 3 sides it has 3 wts and 9 tubes. You can email me at RGonzalez10865@gmail.com or you can call me at 818-429-7405. I am located in CA. Thanks in advance. Mine is for sale.10,000.Owned by walter herschede,given to my aunt who was his controller. To answer your question. I recently spoke with my clock man here in San Antonio. He values the clock at $15,000.00 if I lived on the east coast, and $12,500.00 here in Texas. It needs to be cleaned and oiled.. Thanks for asking. Tried sending you an email. Have you sold the clock yet? How many tube is it 9 or 5? I would be interested in it. What are you asking? Thanks for your comment about your grandparents living in Elizabethville. I think there were two Leitzel brothers, one with a store in Millersburg and the other in Lykens. Glad to know there are some more clocks out there and that they might be worth quite a bit. One of these days I will need to downsize and will advertise the clock. I have had it since August of 1969. Thanks again. My grandparents lived in Elizabethville, PA (very close to Millersburg) from 1936 through 1974. They had the exact same clock as you, and were friends with the Leitzel family – but I suspect a different branch thereof. I believe our clock was purchased at Wannamaker’s in Philadelphia in 1951. I wonder if our families knew each other. These Herschede 217 clocks are not found every house across the US and we have identical models from neighboring towns. I took possession of our clock from other relatives on May 14, 2011 and am already rejuvenating it. It has not run well in roughly 25 years and has not run at all in the last 15-20 years. I am finding that it is much more tolerant and sturdy than I feared. FYI – I have seen these on eBay for $13k and the inner mechanics alone for $4-5k. for $15,000.I would sell mine for $8000. Mine appears to look like yours. I WAS LOOKING AT A LISTING FOR FOR A CLOCK AUCTION BY R.O. SCHMITT AND CLOCK AUCTION OCT 31, 2010 AND #503 AND #511 LOOK LIKE YOUR CLOCK. CHECK TO SEE IF IT IS A WINTERHALDER MOVEMENT MADE IN GERMANY. THEY USUALLY BRING MORE MONEY. THE SCHMITT CLOCK IS A WINTERHALDER AND PRE AUCTION VALUE IS LISTED AT $1500 TO $2500 FOR EITHER CLOCK. THIS IS A HUGE AUCTION FIRM AND YOU CAN GOOGLE THEM. CLOCK #503 SOLD FOR $850 AND #511 SOLD FOR $900 YOU MAY HAVE A HARD TIME GETTING WHAT THEY WILL. I WOULD NOT SELL MINE THAT CHEAP! Yes, I will sell it for the right price. What do you offer?